Wildcat Movers in Richardson TX has always been know for our outstanding moving services. Moving in Richardson require Smart Athletic Movers which is exactly what Wildcat Movers provides to every client. We are licensed and insured, up front pricing, and no hidden fees. Give us a call today about your Richardson moving needs, and one of experienced Move Coordinators will develop a flawless plan for your next Richardson move. When hiring a Richardson Mover we here at Wildcat Movers suggest reading our online reviews on Google and Yelp. Wildcat Movers always strives to provide the best possible service to all of our clients. Search our Richardson Moving Reviews to see why Wildcat Movers has such a great reputation. Packing and Moving is a very challenging and time consuming task. When looking for a Richardson Mover consider a moving company that has the experience to not only move your possessions flawlessly, but also pack with the same care as to not damage your belongings. Richardson Texas is a suburb nestled in the hard of the DFW metroplex between Dallas, Plano, Garland, Sachse, and Murphy. Richardson is known for Breckinridge Park, CityLine, and Eisemann Center for the Performing Arts. Richardson is also corporate headquarters to several large firms including State Farm, Fossil, MetroPCS, and Service King. Apartment Moving in Richardson TX requires movers that know how to properly wrap, dolly, and stage furniture at the elevator. 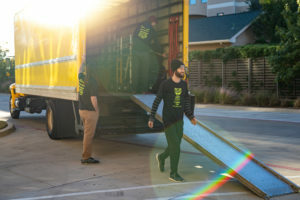 Wildcat Movers has experience moving in several of Richardson popular complexes including GreenVue, Alexan Crossing, Alexan Central, Windsor CityLine, Anthem CityLine, The Pradera, and Marquis at Waterview.